Somehow we've come to accept, regarding government policy, that there are separate "economic" issues and "social" issues, the former being issues having to do with our pocketbook and the latter being issues touching religious values and behavior. But this is a mistake. The economy is also a social "values" issue. It's about the extent to which we respect private property and it's protected from politicians. The Fifth Amendment to the Constitution guarantees protection from being "deprived of life, liberty, or property, without due process of law." The Ten Commandments demand respect for marriage (honor your parents) and for life and property (don't kill, don't steal). Consider the Obamacare mandate, which went into effect Aug. 1, requiring employers to provide "free" contraceptives, sterilization and abortion-inducing drugs to employees as part of their health care plan. The uproar about this has been about its violation of religious liberty -- forcing employers to provide these services regardless of their religious convictions. But this wouldn't be possible without politicians seizing private resources of citizens to pay for this mandate. 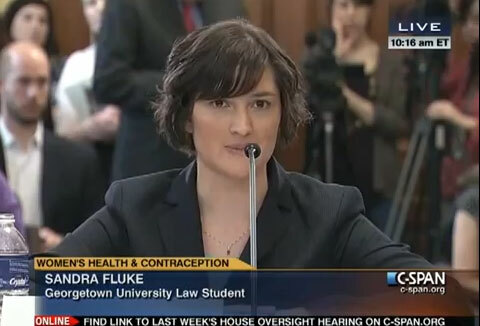 In a recent Huffington Post column, she touts Obamacare as a victory for women's "health care rights" and the fact that contraceptives are now available "at no cost." It had nothing to do with claiming any so-called right to violate the private property of some and force them to pay for another's lifestyle choices. The costs of Obamacare, including paying for Sandra Fluke's contraceptives, come out of our hide in the higher prices we'll pay for products, as companies pass on their higher health care costs to consumers. And as wages stagnate, as employers take bigger chunks of paychecks to cover health insurance costs. The CEO of Papa John's Pizza recently said that Obamacare will add 11 cents to 14 cents in cost to each pizza delivered. University of Chicago economist Luigi Zingales notes in his new book "A Capitalism for the People," "If workers feel poorer, it is because rising health insurance premiums have been swallowing up most of their real wage increases of recent years." Premiums for family coverage, per Zingales, rose 50 percent from 2003 to 2010. According to economist Art Laffer, government stimulus spending over the last five years totaled $4 trillion. That's almost $13,000 for every American man, woman and child. Our money, spent by politicians, according to Laffer, on "banks and companies that fail, solar energy companies that can't make it on their own, unemployment benefits, and the like." How can we possibly have a functioning economy when politicians can randomly steal from citizens? When, basically, we have legalized theft. Our economic crisis is also a crisis in values. At the root of our floundering economy is a loss of respect for the sanctity of private property that goes hand in hand with the loss of respect for the sanctity of life and marriage.